Marc Levers was man-of-the-match for Peterborough Phantoms at Swindon. Peterborough Phantoms kept the English Premier League title race alive for another night – and also ensured they remain in pole position to secure second spot. The city side eased to an impressive 5-2 success in Swindon last night (March 12) to complete a six-day double over the Wildcats. They had won 5-4 on their own ice last Sunday. Phantoms netminder Janis Auzins was in fine form in Swindon. The latest pair of points were enough to delay table-topping Basingstoke’s crowning as champions for another 24 hours at least. Bison won at Telford last night to retain their seven-point cushion and will lift the title if able to beat Swindon tonight (March 13) or if Phantoms slip up in their fixture at basement boys Bracknell. 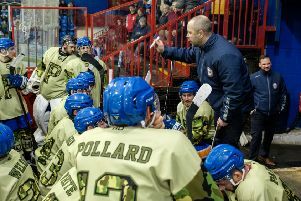 Phantoms coach Slava Koulikov said: “We haven’t really looked at the title all year and that’s still the case. “Last night was about putting in the right performance, getting the right result and trying to finish as high as we possibly can. Ales Padelek fired Phantoms ahead at the Link Centre last night, but they were pegged back by a powerplay strike from Tomasz Malasinski with 30 seconds of the opening period remaining. Phantoms made the most of a numerical advantage of their own to regain the initiative through Milan Baranyk’s sole strike of a second session in which Wildcats player-coach Aaron Nell was twice denied by the pipes while netminder Janis Auzins stood tall on several other occasions. It was Padelek’s turn to ping the goal-frame early in the final period, but Phantoms soon found the net with a quick double putting them in command. Baranyk and Lloyd Gibson struck just 22 seconds apart. Captain Jan Kostal did reduce the hosts’ arrears but Phantoms had the final say when Craig Scott raced in to beat netminder Stevie Lyle short-handed. Koulikov added: “We shuffled things around to have a look at some different combinations ahead of the play-offs - and I was really pleased with what I saw. Phantoms were without the suspended Edgars Bebris, who is clear to return tonight when Phantoms travel to bottom side Bracknell. Victory at The Hive (6pm) would complete a hat-trick of clean sweeps against a Bees side who last defeated Phantoms late in the 2012-13 season. The city side have reeled off 17 consecutive victories since then. The injured trio of Jason Buckman, Craig Wallis and Martins Susters continue to sit out while James White will play for Islanders to ensure he reaches the required number of appearances to be eligible for their play-offs at National League level.